1. Preheat the oven to 200˚C, gas mark 6. Rub the chicken with the oil and lemon juice, season and push the squeezed lemon shell inside the cavity. Put the chicken, breast-side down, in a roasting tin and pour in about 5 tbsp water. Roast for 1 hour then turn the chicken breast-side up and roast for another 15-20 minutes, until the skin is crisp and brown, and the juices run clear when you cut into the bird between the leg and the body with a knife. 2. Meanwhile, for the pilaf, fry the onion in the oil in a large frying pan over a medium heat, covered, for about 20 minutes until the onions are brown and caramelised. Stir often, uncovering towards the end. 3. At the same time, bring the chicken stock to the boil in a large saucepan. Stir in the ground cinnamon, allspice and coriander with some salt (taking into consideration the saltiness of the stock). Stir in the bulgur and cook over a low heat, with the lid on, for about 10 minutes until the liquid has been absorbed and the grain is tender. Fold in the butter and season. 4. Put the walnuts and chestnuts in the frying pan with the fried onions and cook, stirring, for 2-3 minutes, then mix into the bulgur with the raisins. For the sauce, use a fork to beat the yogurt with the citrus zests, plus the garlic, if liked. 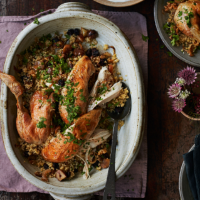 To serve, cut the chicken into pieces, sit over the pilaf and pour over the lemony sauce at the bottom of the roasting tin. Sprinkle over the parsley and serve with the yogurt sauce on the side.